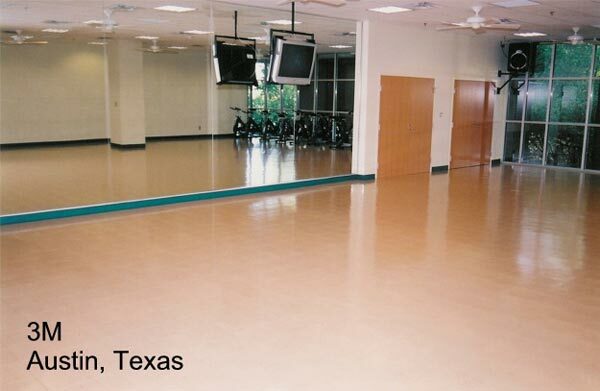 Sport Court® Houston has been supplying safe, suspended Sport Court® aerobics and dance flooring since 1978. Sport Court® was the first modular sports flooring manufacturer to create a safe alternative to wood flooring, carpets and rolled synthetics. We install aerobic and dance floors for large facilities, including dance studios and even home gyms. Contact us today for a free consultation or on-site estimate. Now, with the introduction of Response Maple Select, your studio or facility can have the look of real maple flooring without the expense and upkeep of a wood floor. Its factory applied urethane finish creates an elegant look while being durable and long lasting. Sport Court®'s patented "lateral forgiveness" and superior shock absorption makes Sport Court® the ideal aerobic and dance floor for your facility. Sport Court® Houston aerobic and dance floors can typically be installed in two to three days, making them an excellent choice to retrofit over any hard flat surface, and they require less maintenance and repair than most other indoor surfaces. Even better, since it does not glue or nail down to the subfloor, you can take your dance floor with you if you ever move or change locations. View our aerobic floors photo gallery. The latest addition to our line of quality indoor sports flooring products, and is the only modular flooring in the industry with SportGuard™ advanced surface technology-a factory-applied polyurethane top coat that lends a lasting shine and increased durability. We also carry our revolutionary Maple Select™ flooring, which delivers the look and feel of a suspended hardwood maple floor. This is not a stick-on vinyl application that will curl and peel, the hardwood maple pattern is embedded in the flooring and protected by the urethane top coat.